Payment for our Hosted Karaoke Packages is required prior to the date of the event or cash on our arrival at the event venue. Payment can be made via direct deposited into our bank account. Direct deposit payments must be paid 4 full working days prior to the event to allow time for bank transfers. Or with Visa and MasterCard via Paypal (secure online payment). Credit card payments incur a 3.4% processing fee by Paypal. We are immediately notified by Paypal that payment has been made. If paying by cheque funds must be in our account and cleared prior to event date. This may take up to 5 working days. You can also pay with cash on our arrival, prior to the set up of karaoke equipment. We set up directly after Bump In and the start time of the Hosted Karaoke Package directly follows setting up. In circumstances where there is time between Bump In and Set Up and/or Set Up and the commencement of the Hosted Karaoke Package the client will be charged at the additional hourly rate specified for each of our Hosted Karaoke Packages. Alternatively the duration of the Hosted Karaoke Package will be reduced by the time delays between Bump In, Set Up and commencement of the Hosted Karaoke Package. The client contact should make them selves available and easy to find when the Karaoke Host arrives at the venue if instructions regarding setting up or for payment is required. If the client contact is not available and their presence is required for setting up this will impact on the start time and we will not compensate for delays. Access to the Set Up and Stage Area are an important consideration. Our prices are based on distance of 15 unobstructed meters between the loading area and the Karaoke Set Up area. Obstructions like stairs, elevators, tables and chairs, party guests, security pass doors, and the like, often delay the start time. It is recommended that the customer gives us the Venue Managers contact details so we can make arrangements. In some circumstances this may affect our price based on advice from the Venue Manager. In situations where this has not been discussed with us prior to invoicing there will be no compensation to the customer for a late start. Inaccurate information from the venue manager resulting in delays will not be compensated for by us. We allow 45 minutes for unloading and setting up. This is adequate for the majority of events. Choosing a venue with a suitable loading area is highly recommended. If a loading area is not available and the Host needs to find a suitable place to unload it will likely result in the karaoke starting later than the time booked. In this situation there will be no compensation to the customer for a late start. The Karaoke Host will need an unloading area and parking. If there is no street parking within 200 meters of the venue parking will need to be provided by the customer. Arrangement may vary based on the room shape. A karaoke Set Up and Stage Area is required for the Karaoke Host and Performers. The Karaoke Host will need an area of at least 2 meters by 1.4 meters. A table to set up on is also required with a tabletop area of at least 1.4 meters by 0.6 meters. The table will be inside the area for Karaoke Set Up. The table will need access to the mains power and be no further than 400cm from the table. 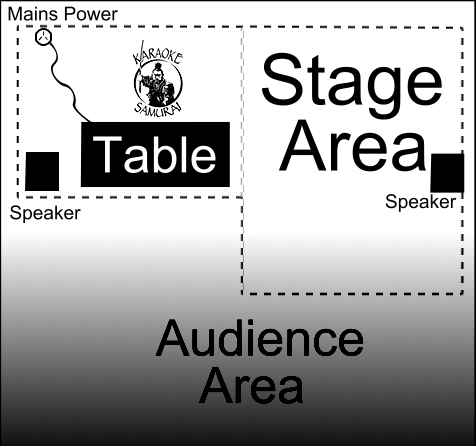 The karaoke Stage Area should be an area 2 meters wide and 3 meters long directly beside the Table for the Karaoke Host. To avoid delays we require notification of set up and staging logistics that are outside those outlined above. If we are not notified, prior to us accepting the booking, no compensation will be considered for delays to the start time. The karaoke will finish at the scheduled time. Requests for one more song will not be accommodated. If circumstances allow and at the discretion of the Karaoke Host the client may request additional time. Payment for additional time will be at the additional hourly rate specified for each of the Hosted Karaoke Packages and must be paid in cash prior to the start of any additional time. This is not negotiable. The invoice will be amended to reflect this change and e-mailed to the client at our earliest opportunity. Karaoke Samurai staff do not and will not work without complete payment. Any expectation they will do so is not valid. We require 5 days notice cancellation notice prior to the karaoke event date for all of our Hosted Karaoke Packages or the client booking the Hosted Karaoke Package is liable to pay the total cost for the event. Note: Booking one of our Hosted Karaoke Packages is seen as acceptance of these terms.